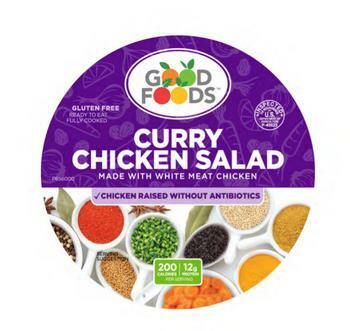 Good Foods Group of Pleasant Prairie, Wis., is recalling approximately 130 pounds of fully cooked ready-to-eat curry chicken salad. The product contains tree nuts, an allergen not declared on the label. There have been no confirmed reports of adverse reactions due to consumption of the recalled product. 130-lbs of 32 oz. deli cups with “GOOD FOODS, CURRY CHICKEN SALAD, MADE WITH WHITE MEAT CHICKEN” on the deli cup lid and “GOOD FOODS, ARTICHOKE & JALAPENO DIP, WITH rBST-FREE* GREEK YOGURT” on the side of the deli cup. The product, bearing lot code 489221-2B, with a time stamp range of 23:30 to 00:30, and establishment number “P-45623” inside the USDA mark of inspection, was shipped to retail locations in Illinois, Indiana, Kansas, Minnesota, Missouri, Nebraska and Wisconsin. Consumers with questions may contact Good Foods consumer relations at (844) 872-6999.